The PocketMate 140 was introduced together with the smaller sibblings PocketMate 100 and PocketMate 120 late in the market. 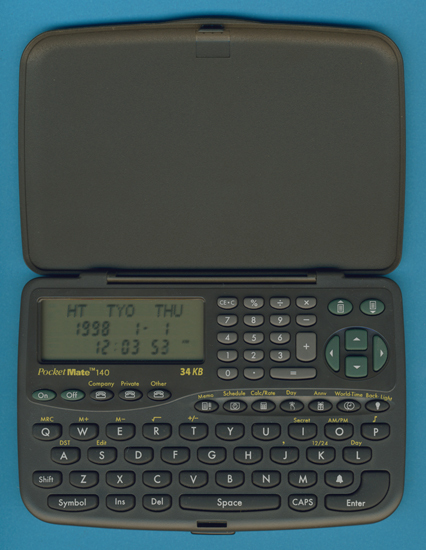 The PocketMate 140 is the successor of the PS-3960i. The display of the PocketMate 140 consists - like the PocketMate 100 and 120 - of one line for alphanumeric characters and two lines supporting only numbers but is backlight illuminated. Dismantling this PocketMate 140 manufactured in October 1999 by Compal Electronics in Thailand reveals a very clean architecture based on a Toshiba Application Specific CPU and an additional memory chip with 32k Byte capacity. The PocketMate 100 series is based on Chip-on-Board (COB) technology and we can't decipher the manufacturer and types of the ywo Integrated Circuits hidden under the two epoxy blobs. The design of the PocketMate 140 fits neatly with the PocketMate 300 series. The whole PocketMate series was discontinued in the year 2000.